Serve this fruity chutney as a condiment with roasted meats. 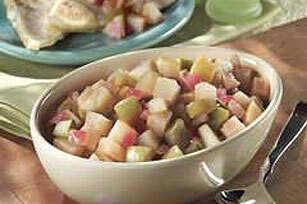 Our Pear-Apple Chutney is simmered with onions, brown sugar, vinegar and spices. Heat oil in large skillet on medium-high heat. Add onions; cook and stir 5 min. or until crisp-tender. Add all remaining ingredients except fruit; mix well. Stir in fruit; simmer on medium-low heat 30 min. or until fruit is tender, stirring occasionally. This delicious chutney can be prepared in advance. Cool completely. Refrigerate up to 5 days. Reheat just before serving.